INDEPENDENT TD MAUREEN O’Sullivan has announced that she will be allowing her name to go forward for the position of Ceann Comhairle. The Dublin Central deputy had emerged as a possible contender in recent days after she was approached by Green Party leader Eamon Ryan about contesting for the position in the 32nd Dáil. TDs will, for the first time, vote to fill the vacant Dáil chair position on Thursday under a secret ballot following reforms introduced by the outgoing government earlier this year. Fine Gael is not putting forward an official nominee but backbenchers, including Andrew Doyle and Bernard Durkan, are seeking support. Waterford TD John Deasy has also been mooted, but his candidacy is unconfirmed. Sinn Féin has confirmed that it will nominate veteran Cavan-Monaghan TD Caoimhghin Ó Caoláin while Fianna Fáil has put forward party whip Sean Ó Fearghaíl. Any TD seeking a nomination must obtain the signatures of seven other deputies. Nominations close at 6pm tomorrow. The job – which was held in the last Dáil by Fine Gael’s Seán Barrett – is particularly coveted due to the possibility an election re-run. In such a scenario, whoever has been selected as Ceann Comhairle will automatically retain their seat. The role is essentially that of speaker of the house, with a responsibility to impartially ensure that TDs from across the chamber follow Dáil rules. In a statement this afternoon O’Sullivan said that the position is “not a gift from the ruling parties” and noted that it was fitting she had announced her candidacy on International Women’s Day. 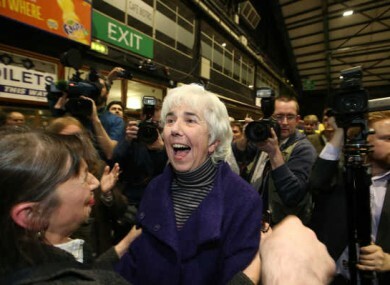 If elected, O’Sullivan would become the first woman to hold the position, although not the first independent. It was held by John O’Connell, an independent from Dublin South-Central, for a period between June 1981 and December 1982. Seán Treacy, an independent from Tipperary South, held the position in three Dáil’s between 1987 and 1997. O’Sullivan was narrowly re-elected in Dublin Central last month despite receiving just 1,990 first preference votes and finishing seventh after the first count. She was elected on the 11th count after benefitting from significant transfers to put her ahead of other candidates. Email “A TD who nearly lost her seat is going for one of the most important jobs in the Dáil ”. Feedback on “A TD who nearly lost her seat is going for one of the most important jobs in the Dáil ”.